One does not dispute the risks inherent to climbing glaciers, and I was well aware of that when I hiked on the Mendenhall last summer. Ice and gravity together at that magnitude is altogether treacherous, wild, and alluring. 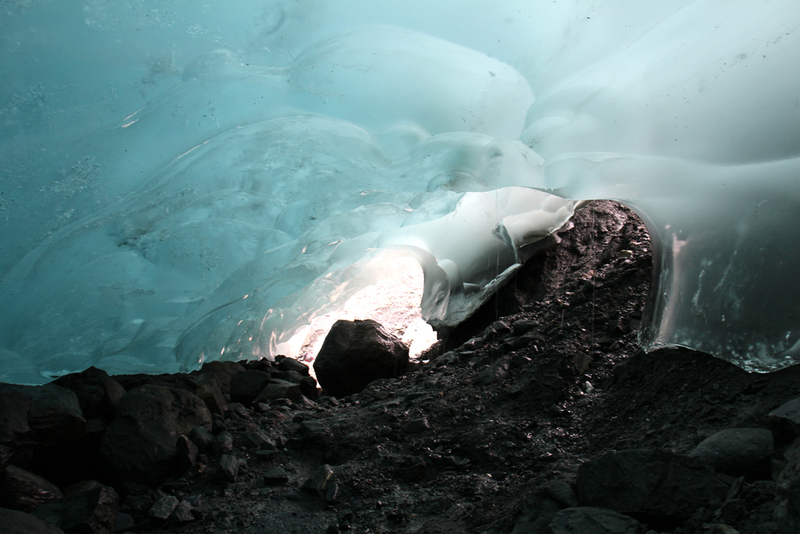 Which was exactly why I wanted to see it – namely for its ice caves. 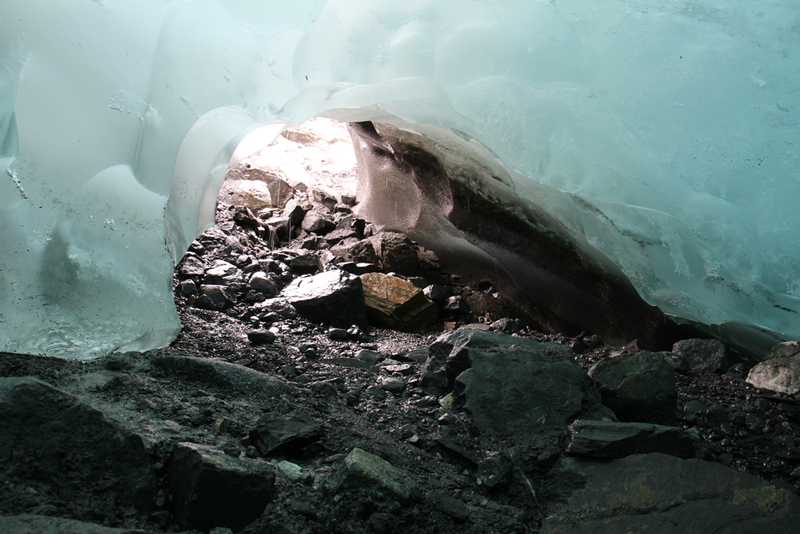 Formed by meltwater along its edges, its cave tunnels draw many ambitious hikers each summer. Visitors like me, who want to see its magical blue, glowing ice walls and ceilings for ourselves. But it is no easy trip, and is not without its share of bangups – either from tourists who don’t know what they’re doing, or people who are just unlucky. I had no experience or gear needed for any of this, and signed up for a guided trek with Above and Beyond Alaska, one of two local outfitters who were licensed to take hikers out on that busted, immensely rewarding trip. They picked me up from downtown that morning and brought me and four other people to the trailhead on the west end of Mendenhall Lake twenty minutes later. We geared up for a long day of hiking, starting on the West Glacier Trail around 10:00. Thick, mossy woodlands of Alaska’s Tongass National Forest enveloped us as our guide Cory led us along the lakeside. It was a dense, temperate rainforest – a faerie land of Sitka spruce, alder, willow, and an occasional break of sun through the canopy. A steep ridge lay between us and the glacier. The trail wound up the side of it in numerous switchbacks. We ascended for a while, still over our heads in wild overgrowth. After an hour of hard climbing, we reached an open area of moraine and rock near the ridge’s summit, where only the toughest, scraggly flora can take root and grow. Soon, we were scrambling up the final edge of the climb, careful not to slip and tumble backwards. Some animals lock horns in places like this, I thought. We made it to the top and looked out at the panorama that has made the Mendenhall famous. Huge, steep mountains surrounded the glacier and the lake below as it reached across the valley for three miles before flowing into the river. Tiny profiles of kayakers could be seen across the lake, 1,000 yards away. Above them, Nugget Creek glimmered against the mountains like a silver ribbon. 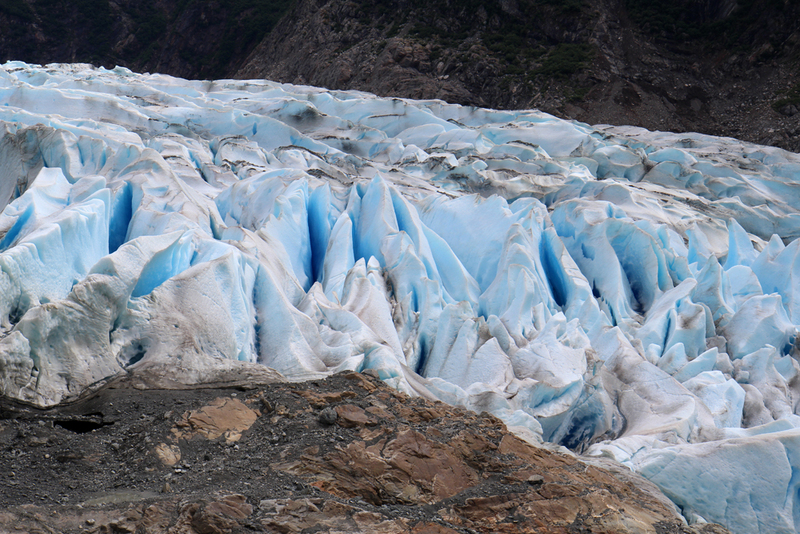 The immense hull of the glacier in front of us had a huge labyrinth of blue and white spires that looked like the scales of a sleeping ice dragon of terrible power. 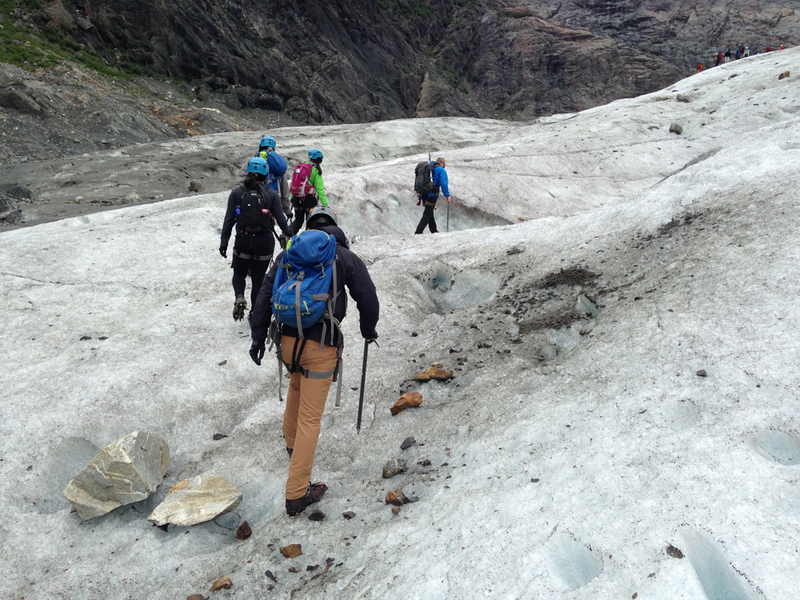 We ascended down the trail towards the west end of the glacier’s terminus. The earth was loose with gravel, no doubt at one time ground up and washed out from higher up. We barely had a trail to walk on, as the slope was almost entirely scree and loose dirt. It was exhausting and we weren’t even on the glacier yet. We got to the edge of the ice and took out our climbing gear. 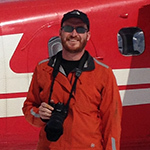 Cory packed each of us with crampons, a harness, an ice axe, and a helmet. 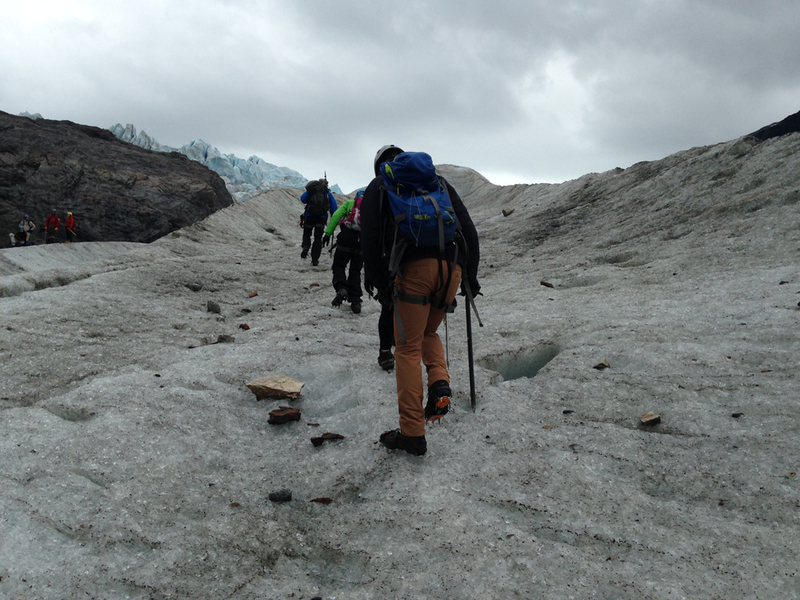 Once we were all fitted, we stepped onto the ice and started walking along the glacier’s surface. It was smooth at first, but became increasingly uneven and intimidating. Its spires seemed to tower above us as we approached the crevasses further up. All at once, my head started throbbing. As a coffee addict, I knew what it was right away. Nothing I could do about that now. The ground got even more erratic, as Cory had us climb up small, icy walls, peer into crevasses, step over meltwater streams. 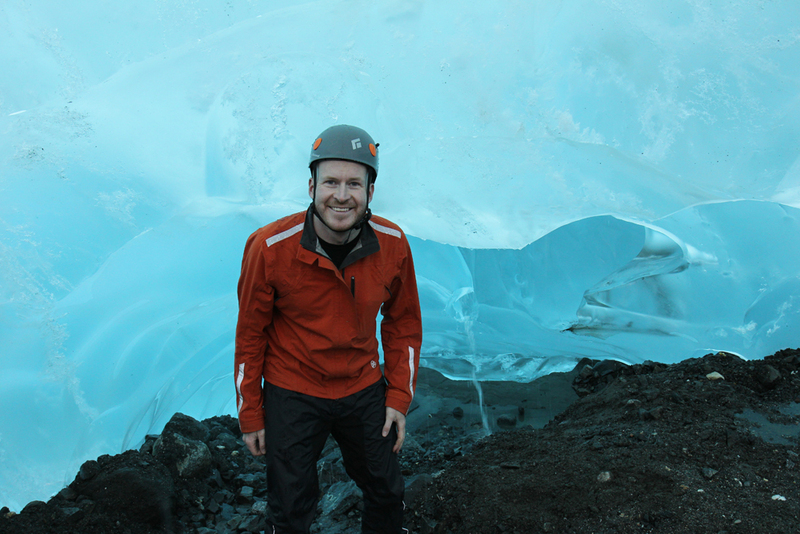 In the picture above, I can be seen looking warily into a crevasse. And this one is small by all standards. 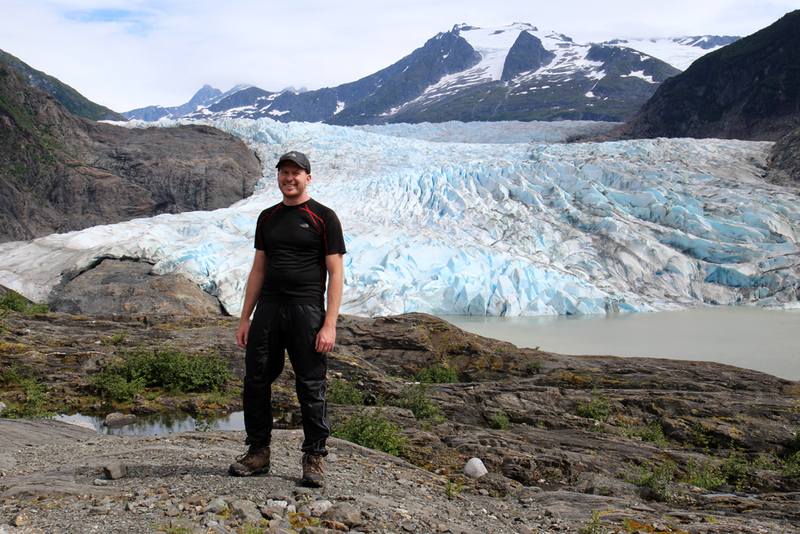 We hiked back out to the ridge and went a few hundred feet up to one of the more recent caves along the glacier’s edge. Originally a much bigger cave existed, but it finally collapsed last year. 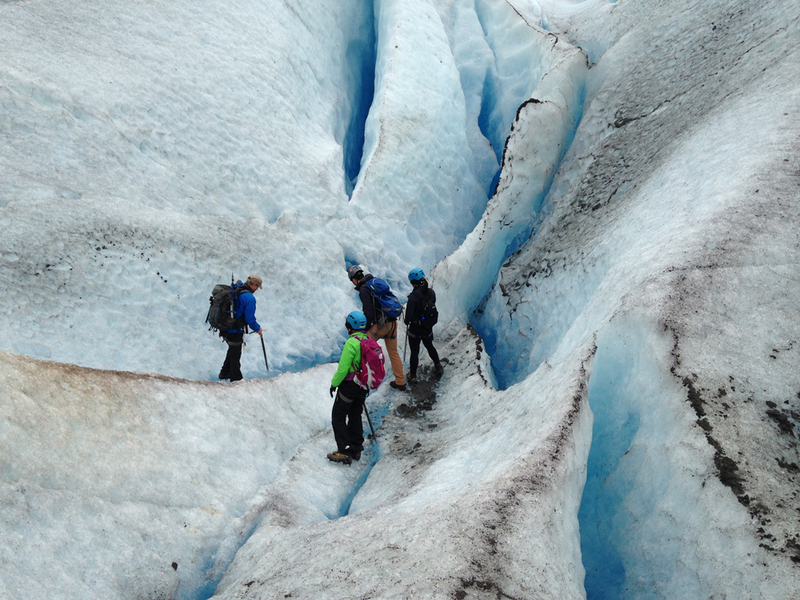 Fortunately, the glacier’s tunnel system is dynamic and changing all the time. This cave, a much smaller one, was just big enough for people to crawl in and take pictures, which plenty of tourists – myself included – were doing. Satisfied we got our moneys’ worth, we ate lunch, packed up, and hiked back up the ridge. I expected the hike back over that ridge to be just as hard as it was going in, and it didn’t disappoint. And my head was absolutely pounding by now. I want coffee, dammit! Cory led us along a higher trail with more scrambling, jumping over rocks, one rappel down a boulder near the tree line, and then a 45 minute downhill walk to the shuttle. He dropped us off in downtown, where I went straight for the nearest coffeehouse like the addict that I am. That was a tough hike, but nothing I couldn’t write off as training for what comes next. Onward to Canada!